By taking one (and only one) panel from each of ten randomly selected comic books, I will now spin for you a tale of love, hope, and sordid physical violence! We begin with a story as old as time, a triangle of love between a beautiful woman and two men (in this case three young students at a super-hero training academy, but love is love!). Alas, Annie's affections are unrequited by the target of her affections, the mustachioed Bill (the man with the "gorgeous tush") -- or his horse, either, for that matter. For the third member of the love triangle, Linkvold, watching his rival spurn his love's affections is made worse by the taunting of his friends. He tries to pass off his pain as so many other young men have done in the past, but no one is fooled. 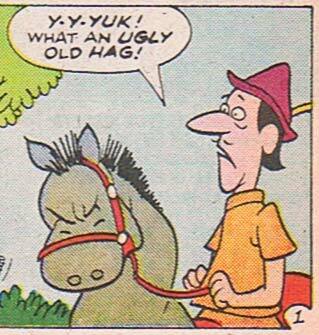 Being a kind-hearted young man, Linkvold calls Bill to admonish him for calling Annie a "hag", but Bill reacts angrily, taking off on yet another conveyance. 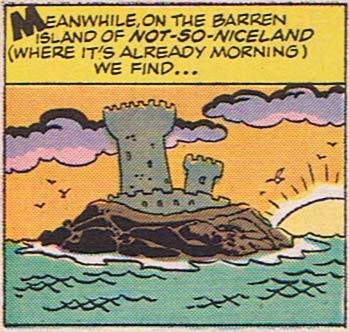 On that dread island resides The Djinn, master of mental arts and sworn enemy of the academy, who -- sensing an opening in the form of Linkvold's jealousy -- strikes! Taking control of the callow youth's mind, The Djinn forces a physical change as well, transforming Linkvold into a ravening beast bent on destroying both his rival and his love! Bill may be a dapper dandy, but his highly keen senses warn him just in the nick of time that danger is afoot! Forewarned or not, however, Bill is no match for the jealous rage of the light-haired Linkvold, as Annie looks on in horror! Tune in next week* to find out if The Djinn's heinous plan will work, or if Bill and Annie will somehow overcome their hypnotized, powerful friend! *Not actually continued next week. "Coyote", Vol. 1, No. 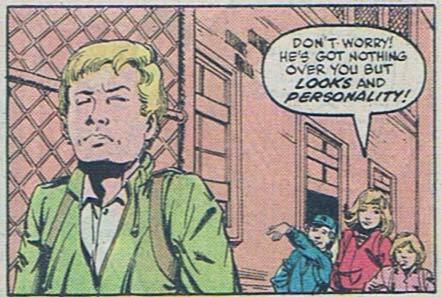 1, ©1983, Marvel Comics Group., Stephen Englehart, and Stephen Leialoha. These cats were on some serious peyote, my friends. "Bullwinkle and Rocky", Vol. 1, No. 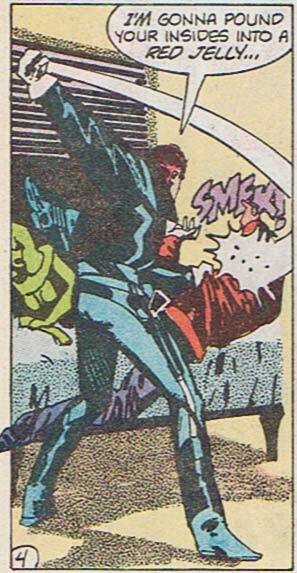 1, ©1987, Marvel Entertainment Group. Doing these is hard enough without Rocky and freaking Bullwinkle, believe me. "Power Pack", Vol. 1, No. 18, ©1986, Marvel Comics Group. "Mars", Vol. 1, No. 4, ©1984, First Comics, Inc. This issue features the dead souls of famous artists cavorting around naked with a garter-wearing spaceship crash survivor while dinosaurs eat them all. Seriously. "American Flagg! ", Vol. 1, No. 7, ©1983, First Comics Inc. and Howard Chaykin. "Bullwinkle and Rocky", Vol. 1, No. 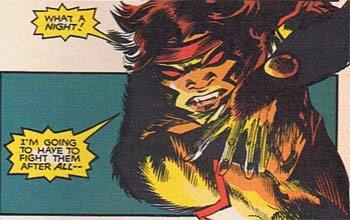 2, ©1988, Marvel Entertainment Group. "Coyote", Vol. 1, No. 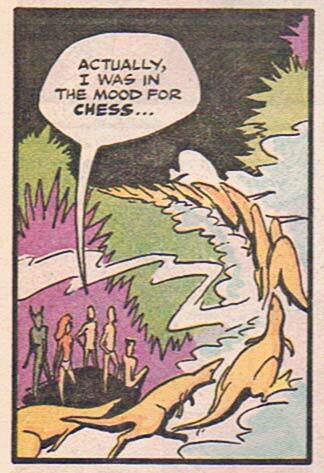 3, ©1983, Marvel Comics Group., Stephen Englehart, and Stephen Leialoha. "Coyote", Vol. 1, No. 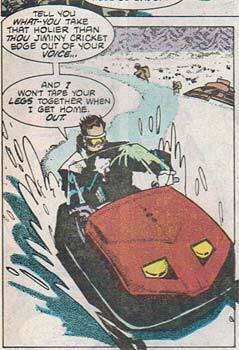 2, ©1983, Marvel Comics Group., Stephen Englehart, and Stephen Leialoha. "Marvel Age", Vol. 1, No. 96, & copy;1991, Marvel Comics. "American Flagg! ", Vol. 1, No. 6, ©1983, First Comics Inc. and Howard Chaykin. This entry was posted in Mashups. Bookmark the permalink.